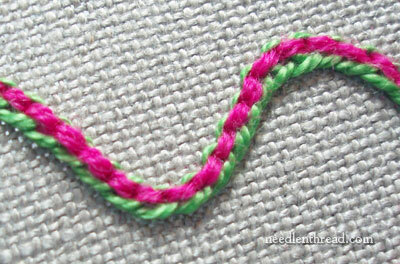 Today’s video tutorial is on the Pekinese stitch. 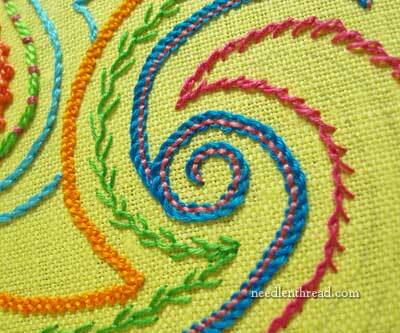 This is a composite stitch that starts with a backstitch line. A second thread is then looped behind the backstitches. In the sample above, the bright blue line with the pink dashes through it is worked in the Pekinese stitch. The stitch takes curves well. It can also be used as a filling, by working rows close together. In yesterday’s Stitch Play article, Pekinese stitch was featured as one of those line stitches that you can “mirror” effectively. Pretty much any type of thread works with the Pekinese stitch. In the photo above, the backstitch is worked with a wool thread, and the loops of the stitch are worked in perle cotton. And in this sample, the backstitch is worked with perle cotton, and the loops are worked with wool. So you can mix and match the threads used in the two parts of the stitch. Here’s the video for the Pekinese stitch. I hope you enjoy it and find it useful in your embroidery endeavors! If you’re looking for other stitch instruction, feel free to check out my other embroidery stitch videos here on Needle ‘n Thread! The collection is growing, and many of the videos have been updated and replaced with newer, clearer editions. Mary, I know it’s probably just a fun piece to you but to me it looks like art. Would you consider letting us see how the whole thing looks? Is it gloriously random? How do you do that? 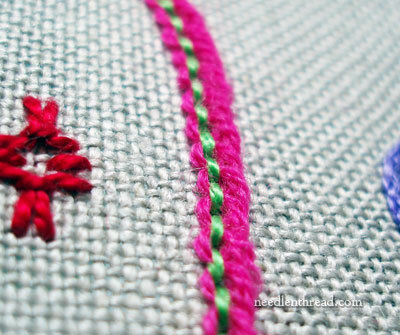 Just looked at the blog on the Pekinese stitch, it looks great I might use this on a project I’m currently starting. Great job you do Mary can’t wait for more and like Heather would love to see the whole project your stitching is perfect! 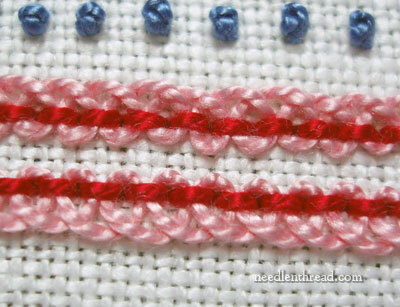 The Pekinese stitch is much like the finishing stitch used along the sides of a needlepoint belt. Thanks for taking time to create the video for us. Such a lovely art. You made it finish so easily. Thank You so much for all your techniques with needle & thread. I think that the two stitches are the whipped back stitch and the Pekingese stitch. Very beautiful and easy explained. I appreciate your sharing. Thanks, I love embroidering.